In a small bowl, combine radishes with spring onion, lemon juice, parsley and salt. Allow to sit while grilling asparagus. Light grill and toss asparagus with olive oil, salt and pepper. Place on the hot grill and cook until tender and lightly charring, turning as needed. Remove from grill and let cool slightly. 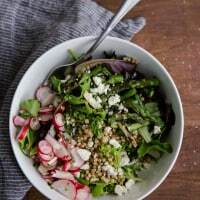 Chop grilled asparagus and toss with lettuce, sorghum, feta, and radish mixture. Serve with a drizzle of olive oil and lemon juice.